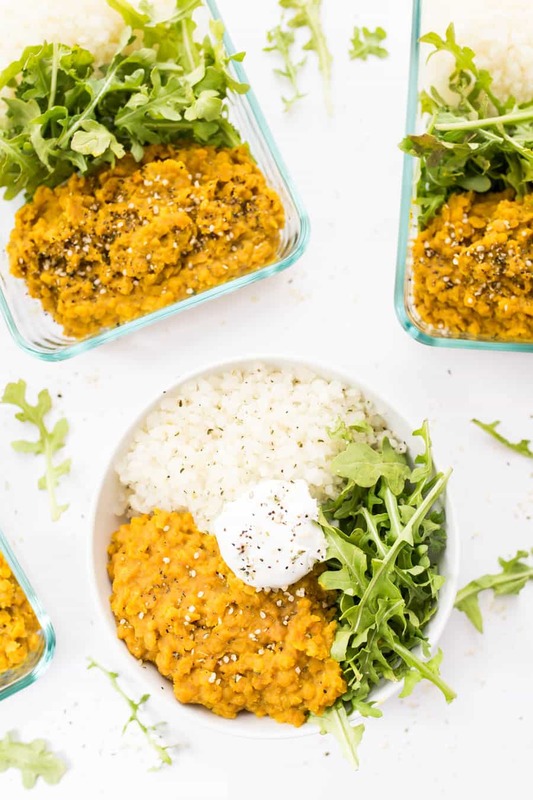 Using just one pot and ready in under 20 minutes, this easy vegan red lentil dal is a flavorful, plant-powered meal! Serve with quinoa or rice, and save the leftovers for meal prep! There's almost nothing I love more that being away for a weekend and coming back to a fully stocked freezer. Whenever I travel, I try to clean out my fridge before I leave and yet when I get home, I just can't seem to bring myself to go to the grocery store. No matter how early my arrival. So when there's nothing to eat for dinner and I don't want to order takeout (because let's be real, takeout isn't that healthy and I rarely eat as healthy while I'm away), my freezer comes to my rescue. I know a ton of you are in the same boat; either you work full time, are a full-time student, or just have those days when life just gets in the way. Having a fully stocked freezer, with meals at the ready, can be a game changer. Today's vegan red lentil dahl is one of the best options for this. 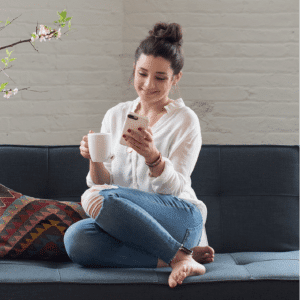 Not only is it quick – only takes about 15 minutes – but it's also inexpensive and freezes beautifully. It's one of those recipes that I'll double just so I can be sure my freezer is totally full of goodness. Dals actually has two meanings. It's the term in India used for dried, split pulses (i.e. lentils, peas and beans), but it also refers to a variety of soups or stews made with these pulses. These ingredients are a staple in Indian cuisine (as well as other countries like Nepal, Pakistan and Sri Lanka) because they are inexpensive and packed with nutrition. They're high in protein, and are rich in vitamins and minerals like B, iron and zinc. And guess what? They're also crazy easy to make. Especially red lentils! 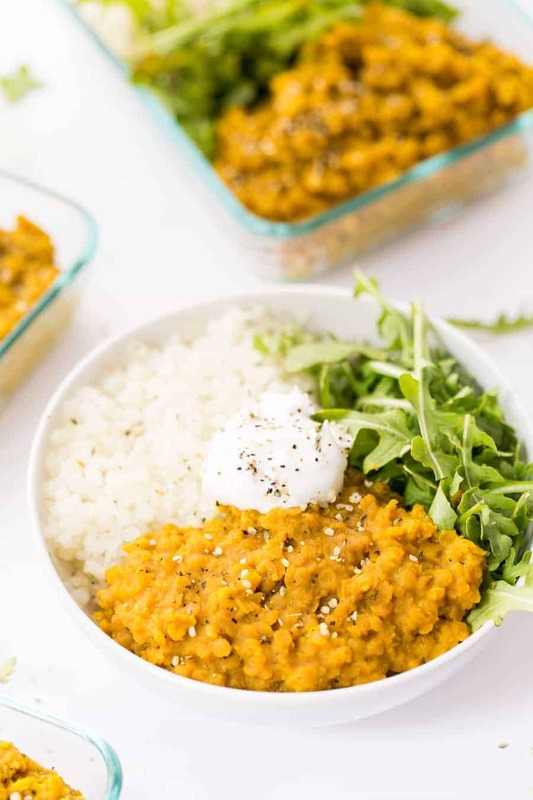 I actually rarely use red lentils in my house, but now that I have this vegan red lentil dal recipe in my arsenal, they're definitely going to become a pantry staple. For this recipe, you'll need less than 10 ingredients, 15 minutes and one pot. I'm not sure a dinner gets easier than that! 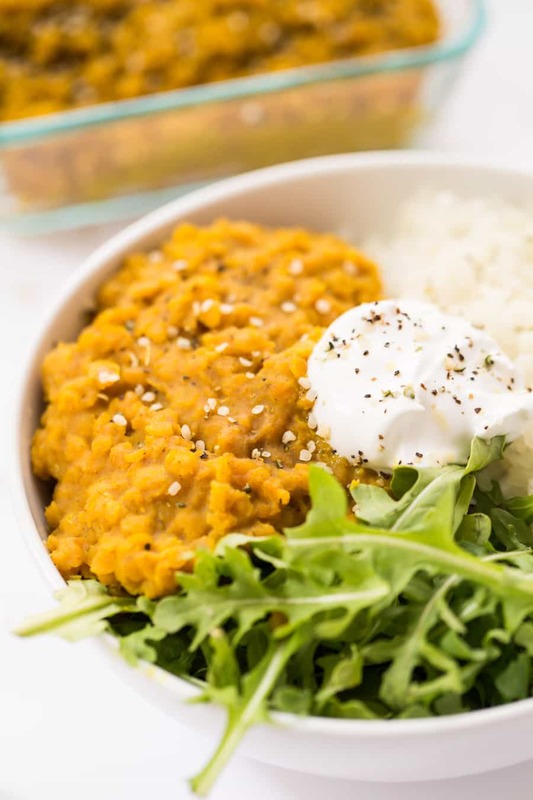 We're using the lentils are as our base, then simmering it in a blend of coconut milk and water to make it extra flavorful and creamy, then spicing it up with a simple spice blend. Dal is best served with either quinoa, rice, cauliflower rice (which I used here) or a flatbread. If you go the cauliflower rice route, check your supermarket because I've been seeing frozen cauliflower rice pop up more and more (and it will save you a TON of time). 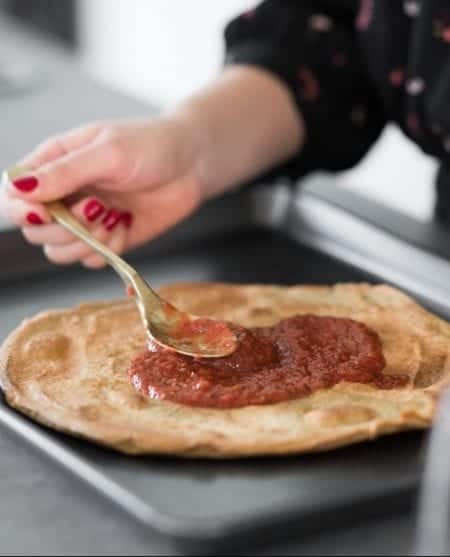 And if you're going to the flatbread route, might I suggest making my quinoa pizza crust and using coconut milk instead of water and curry powder? Oh my that sounds delicious! And did I mention this also works as a meal prep meal? 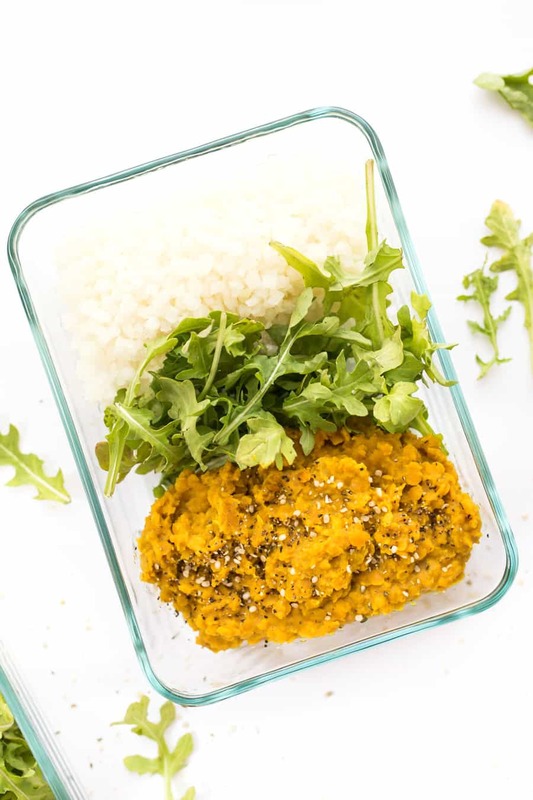 You can organize your container with the rice and dal, add in some greens and then pop it in your fridge for 3 – 4 days. 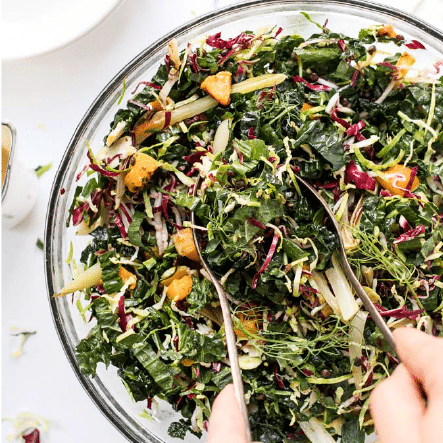 You'll have lunches (or dinners) ready to go and that, my friends, is where a big batch of this will really come in handy. Stock your freezer, stock your fridge and have dinner on the table in under 15 minutes. Yep, sounds pretty idyllic to me! Bring water to a boil, then add lentils and coconut milk. Return mixture to a boil then reduce to simmer. Cook for 10 minutes, until the lentils have softened, then stir in spices and cook another 5.! 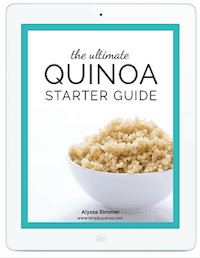 Serve with quinoa, cauliflower rice, white/brown rice or flatbreads! Want more vegetarian dinner recipes? I always have a serving or two on hand in my freezer for busy nights! I absolutely love this recipe. I have found that adding a few tablespoons of vegetable oil or vegan butter adds a nice richness to it, but it isn’t necessary by any means! If I want to use this as a meal prep how long will it last in the fridge?? The adverts are hiding the instructions! Hmm…! They also potentially could have gone rancid if they were really old? This was a really tasty recipe, but I am having a hard time getting the texture right. It always seems that some of the lentils don’t cook all the way or something and I end up with a grainy mixture. Any advice for getting a creamier, smoother texture? Thanks! So simple to make and DELICIOUS!! the amount of liquid was perfect for me, but it did take about 30-40 min to cook. Will definitely make again! Thank you for the beautifully simple recipe! I just made this to enjoy with roasted sweet potatoes, brown rice, veggies, spinach, and hummus for the work week ahead. I always appreciate recipes like this where I can easily draw from pantry staples to make something in a snap that will satisfy me for meals to come! I wanted to make this but didn’t have coconut milk. I used 1 cup organic pumpkin soup and I cup almond milk. I also added 1/4 cup of quinoa since I didn’t have 2 cups red lentils. The flavor was good. I just added a little more curry. Sounds amazing!! 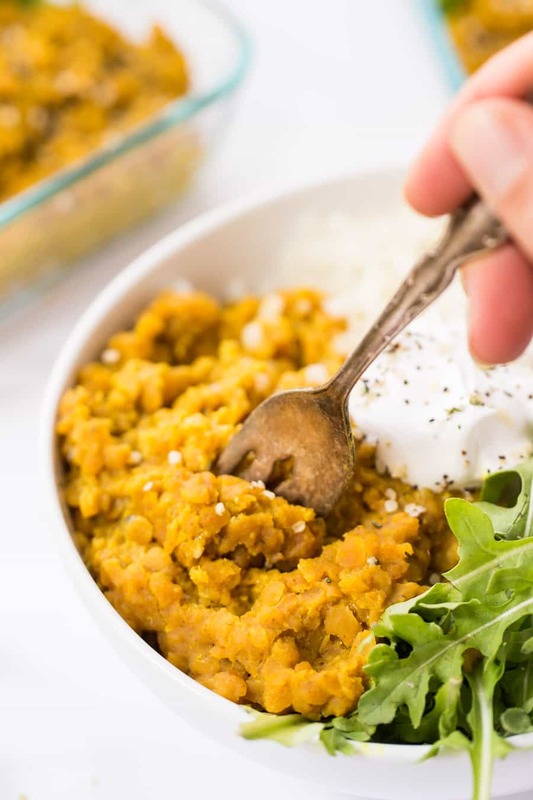 Love the idea of pumpkin and red lentils 🙂 I’m envisioning a new recipe soon! Looks amazing and super easy! Is the nutritional information for only the Dahl? I needed about 2 1/2 cups of water, and I did use red lentils. Very tasty though! I’ll definitely make this again. Me, too. So delicious!! The spice ratio was perfect, even with the extra water (2 1/2 cups water total). Thanks for sharing this! Is it possible to sub almond milk in for the coconut milk? How would that effect cooking time? Yep! You just won’t get the same texture or flavor 🙂 Cooking time should still be the same though! The 1.5 cups water and can of coconut milk ended up being the perfect amount of liquid for me. I was doubtful it would really cook in 15 minutes but it totally did! 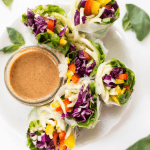 This recipe is the perfect amount of tasty, quick, and easy so I’m definitely going to make it again. Hey, I would love to make this recipe but I am out two seasons. I do not have ground ginger (which I am not sad about I do not like ginger) but I do not have curry powder, I do have garam masala, is that okay to use, or do I need to go and get curry powder? Looks great! OMFG. i have no words this is INCREDIBLE. it’s so tasty!!! this is my new go to recipe when i need something fast, thank you for this!! Half a cup of water is NOT enough! Even with the coconut milk. Can you use green lentils too ? You could, but the texture and cooking time will be quite different! 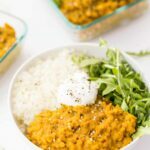 what would be the difference in cooking time for brown lentils? Did you use fresh ginger for this? What is the cream in the center of the dish in the photo? Really enjoyed this recipe, thank you! I’m not sure why, but I ended up needing 2.5 cups of water instead of the half cup. I used at least 2 cups water as well. Added powdered garlic too. Yummy, easy recipe. Thanks for posting. 15 minutes? Really? I’ve never had lentils cook that fast! Yes! 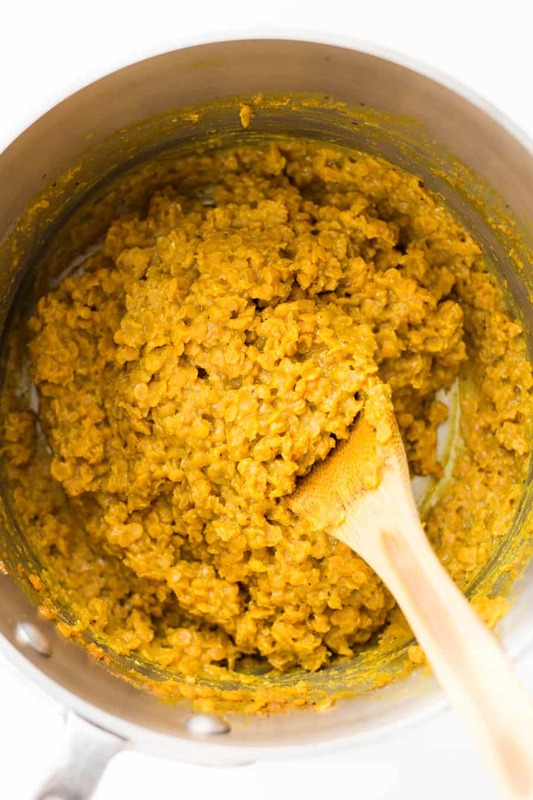 Red lentils are practically instant 🙂 They’re amazing that way! Is the water ratio correct? 1/2 Cup seems like too little… ! To me it looks like the water amount is 1 1/2 cups, or one AND one half cups, not one single 1/2 cup. Ah, I see now that the recipe was updated to reflect the need for more water. It was not enough liquid when I made it. Had to add more water. I too struggled with the liquid content- my liquid was completely absorbed only 4 min in. I ended up adding about a cup more water over the remaining time it took to cook to be able to soften the lentils completely. Very tasty, but next time I will just start with more liquid.